The chefs at Empire City have found 7X ground beef to be sure bet for an amazingly flavorful and juicy burger. That’s because the cuts it comes from are naturally high in the same magnificently marbled fat that’s found 7X’s sirloins, ribeyes, and New York strip steaks. The meat itself is naturally tender, so there’s no need to grind it finely to disguise an inferior cut, and no need to add additional fat in an attempt to add flavor. 7X simply doesn’t need to cheat. 7X burgers are featured on the menu at the Empire Terrace Restaurant, Nonno’s Trattoria, Dan Rooney’s Sports Pub, and the newly opened Pinch by Alain Ducasse. 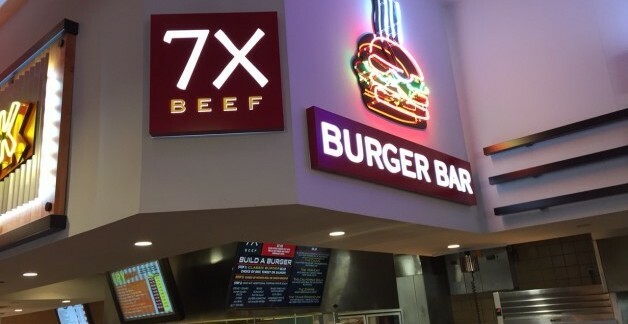 The International Food Court — a quicker option for gamers on-the-go — offers a 7X Burger Bar, where diners can add their favorite toppings and condiments to customize what’s already one of the best burgers they’re likely to encounter. Empire City Casino was founded in 1899 as the Empire City Race Track, and harness racing still goes on there five nights a week. The first phase of the casino was added in 2006, and a second phase which added Dan Rooney’s Sports Pub and Pinch was completed in 2013. Guests are now as excited about the dining options as they are about the racing and gaming. Which goes to show that when Empire City Casino says they’re dedicated to fabulous food, they aren’t bluffing.